In an effort to discover BC’s best sources for ethically raised meat, my fellow journalist Catherine Roscoe Barr and I are hitting the road to visit local farms and see with our own eyes that animals are being treated well. Our most recent excursion led us to Abbotsford’s Sumas Mountain, a BC SPCA certified farm run by husband and wife team Trevor and Kelly Newton. It’s hard to believe, but Trevor is a former vegetarian and member of PETA, the animal rights group. The pair run their farm according to nature. That means no artificial insemination, no castration and no corn for the cattle. 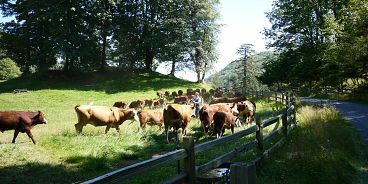 Their herd of 70 cows are pasture-raised and eat nothing but grass. Their pigs live outdoors in their vast fields, as do their turkeys. This operation is so small, they don’t sell their goods to restaurants or grocery stores. To purchase their humanely raised meats, you’ve got to visit their farm, or schedule a delivery to Vancouver by calling 604-853-6333.